Casa Balam ! Beautiful house with private pool. A spacious and private space, a few blocks from the beach of Guayabitos, 2 bedrooms with beautiful wood arched doors, with all the amenities such as TV with Satelital system (SKY), WiFi, Laundry room (washing machine, dryer), new pool, ample parking, security mesh, integral kitchen equipped with all cooking utensils, a little field for aerobics exercises, yoga, etc. 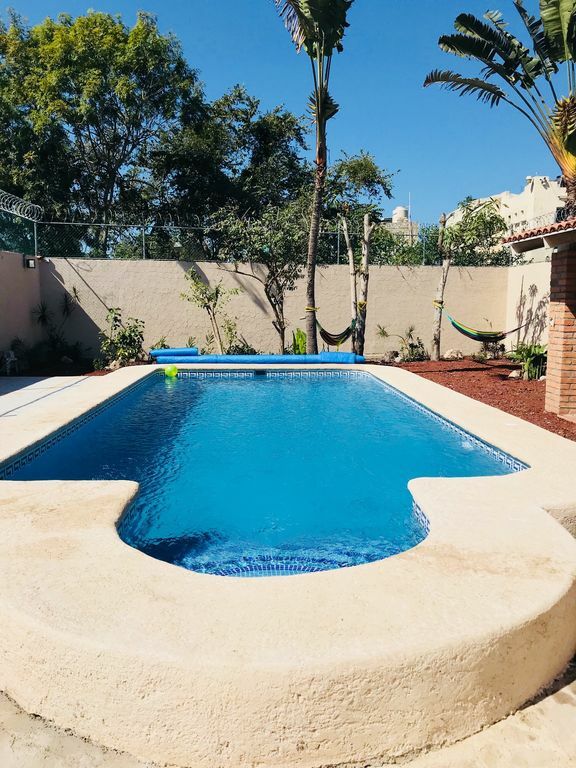 bathroom and outdoor shower, just 50 meters from the best restaurant bar of international cuisine "La Piña Colada", with excellent access to the road to Tepic and Vallarta. Un espacio amplio y privado, a escasas cuadras de la playa de Guayabitos, 2 recamaras con bellas puertas de arco con olor a madera preciosa,con todas las amenidades como TV con sistema SKY, WiFi, Lavadora, Secadora, Alberca nueva, estacionamiento amplio,malla de seguridad, Cocina integral equipada con todos los utensilios para cocinar, una canchita para ejercicios de aerobics, baño y regadera exterior, a solo 50 metros del mejor bar restaurant de la cocina internacional “La Piña Colada”, con excelentes accesos a la carretera a Tepic y Vallarta. La alberca se desperdicia durante el día porque no hay sombra y le falta camastros...utilizamos más el área de asador y si requiere ventilador más potente y más luz es un área hermosa. This is a great property. The total privacy is amazing. We spent 2 weeks here with our grandson and enjoyed every minute. The outdoor grill was used every day as well as the pool. Esteban was friendly and very helpful if a question came up. The iguana that lives at the house was very friendly at the end, our grandson has named him Mr.Pickles. Will definitely book again. We stayed at Casa Balam for 2 weeks in March. We had a lovely time. The house and pool were well maintained. Esteban was great. If we required anything, he was always there in a moments notice. We enjoyed the pool lots. And the house is only a few blocks from Main Street and the beach. We also enjoyed the house pets. iguanas. They were around everyday just for us to watch. The yard has great landscaping and it feels like your very own oasis. I would recommend this place as your getaway for a vacation. My wife and I stayed at Casa Balam with a friend that we were showing Mexico for his first trip. We had a great time, enjoyed the pool and outdoor grill. Casa was very well equipped and clean and tidy; good wifi. Extremely private property that's close to all amenities. Within easy walking distance to beach. My husband and I enjoyed our 2 month stay at Casa Balam. We appreciated the privacy and the great swimming pool. This property is very close to the stores, shops and restaurants, and within easy walking to the very beautiful beach. Antonio, the owner, saw to our needs for things that needed addressing and made our stay one of our best holidays. We were well taken care of by Esteban, who is the proprietor of the La Pina Colada restaurant next door. He was available if we needed anything, and we have made a very dear friend. We look forward to a return visit.